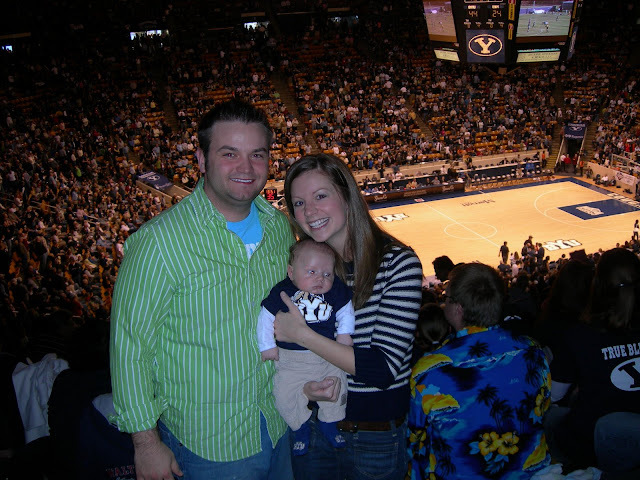 We took Blake to his first BYU game on Saturday. 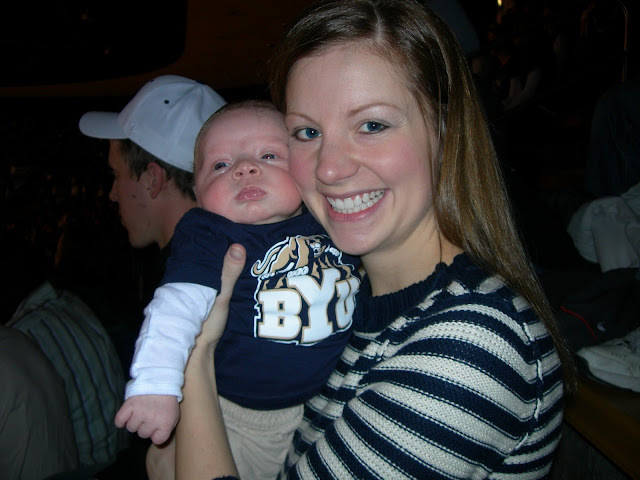 It was actually my first BYU game too. Troy and I have just never really gotten into supporting BYU sports. I think it has to do with neither of us spending our Freshman year at BYU, when you become attached to your school's team and get decked out to go to games with groups of fellow freshmen. Now that we are staying in Utah though, we kind of wish we would have gotten into BYU more. It was pretty fun to go to the game and try to mimic the fight song. We don't really foresee becoming Utah Jazz fans anytime soon, so maybe we will have to work on our love for BYU. It's too bad that Utah doesn't have more good sports teams. Blake was a little angel, as usual. 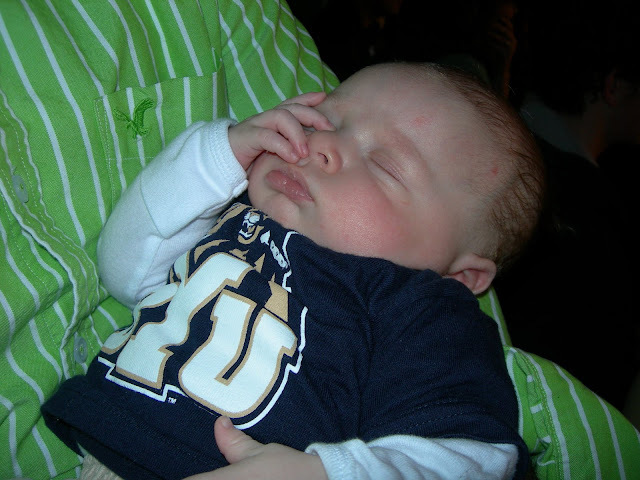 He stayed awake and happy for the first half and then crashed during the second. Other than the lack of sleep, he really has not hampered our lifestyle too much yet! We've taken him to movies, restaurants, and church, and never had a problem! Everyone tells us to enjoy it now. Also, Blake has more BYU paraphernalia than Troy and I combined, thanks to Grandma Tanner. We did (and still do) everything with Stella for a long time. We can still do most things with her along without a lot of fuss. We haven't done a movie in a couple of months, so I don't know if that would work any more. I don't think babies slow you down at all. I guess that will probably change with two. You can definitely take advantage of it now though. Blake is just so cute! We should get together sometime once I get Kylie on somewhat of a schedule. Talk to ya soon! You'll never be true Cougars. You're SPARTANS, the only way to be!!! I'm glad you're able to do so many fun things with Blake still. I gotta agree with the "Enjoy it while you can" remark. It's not that I think babies slow you down or make life less enjoyable. But not all babies have such easy temperaments. So enjoy! We are set for meals all this week, as far as I know...we have more food than we know what to do with at the moment! I'll let you know next week if we still need meals...either way we would love to see you guys. You can stop on over anytime- we love visitors! Hi Lindsey!! I found your blog through Kourtni's. Your baby is so cute!! You have a very cute family. Hope you are doing great! AWWWWW!!! He's so so so cute!